Sagittarius is an incredibly rich area for stargazing, but it’s only easily viewable for a short time. Summer is the best season for observing, but even then it stays low on the southern horizon. Sagittarius is an easy constellation even for children to spot because it has a grouping of stars that looks almost exactly like a teapot. Get out a pair of binoculars or use the finderscope on your telescope and scan the area until you find a fuzzy patch in the sky. Then look through the eyepiece of the telescope to see if you’ve captured a globular cluster, open cluster, or gaseous nebula. Here are a couple of great deep-sky targets in Sagittarius. Most of them can be found by scanning the region of sky above the teapot’s lid. 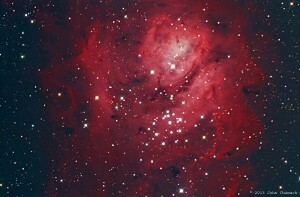 • The Lagoon Nebula, M8, appears more than a degree and a half long and a half degree wide. Compare this to the full moon, which appears a half degree wide. The Lagoon can be seen in binoculars because it shines rather brightly at magnitude 5.8. M8 contains a 5th magnitude cluster NGC 6530, and most of the illumination in the emission nebula is due to a 6th magnitude blue supergiant star named 9 Sagittarii. At 5200 light-years away, M8 shows its brightest area as a region called the Hourglass. Dark nebulae are also found within the Lagoon, including B88, B89 and B296. • A neighboring nebula is the Trifid Nebula, M20, which is a half degree long and shines at magnitude 9. Dust lanes trisect M20, giving it its nickname. Emission and reflection nebula are both a part of M20, and multiple star HN40 provides illumination. M20 has a dark nebula of its own labeled B85. • M22 shines at magnitude 5.2 from a distance of 10,600 light-years. Globular clusters are spherical ancient collections of stars that orbit the core of the Milky Way. • M28 shines at magnitude 6.9 from a distance of 18,600 light-years. • M21 lies near the Trifid and Lagoon Nebulae. At magnitude 6.5, M21 can be spotted through binoculars. • M23 can be found above M21, and it’s a bit dimmer at magnitude 6.9. The Small Sagittarius Star Cloud contains many deep-sky wonders and lies above the lid of the teapot, while the Large Sagittarius Star Cloud can be found above the spout of the teapot. This region also contains the center of the Milky Way Galaxy.